Summary: We parked one vehicle at the Braziel Trailhead, took trail 223 south to trail 208. We went east on trail 208 a short distance to trail 224. Turning southeast on trail 224 we traveled to trail 204 Friday afternoon and camped about halfway to East Bee Falls that night. On Saturday, we hiked trail 204 back to trail 224 and followed trail 224 all the way to the Borden Creek trailhead for lunch. After lunch, we hiked northeast on trail 207 to the Gum Pond Trailhead where my vehicle was located and camped. Sunday morning we finished the loop by taking trail 210 northwest back to trail 223 and followed trail 223 back out to the Braziel Trailhead. The purpose of this hike was to knock out some of the official trails I have not yet completed in the Sipsey Wilderness. 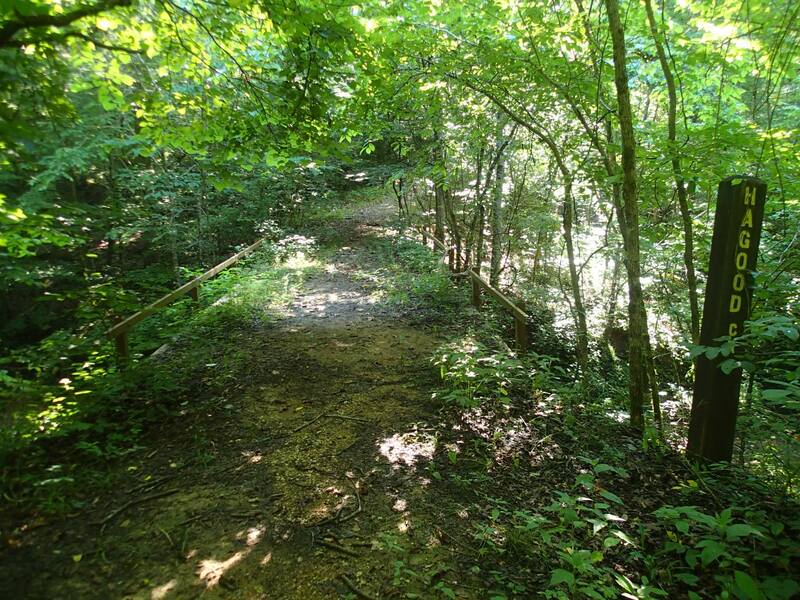 The only trail(s) I have not completed is trail 208 and 209 between Fall Creek Falls and the junction of trail 202. I will complete it this fall. Although we were tempted quite a few times, we did not venture off on any side trails as we knew we already had plenty of miles planned. There are several areas I will revisit once the cooler temperatures return. Before we started hiking, we were going between vehicles from the Gum Pond Trailhead and Braziel Trailhead and saw three wild turkeys just walking down the road. We got rather close before they took off flying to the trees. This was not the last of the wild animals we saw during the hike. Friday afternoon at 6:19 pm in 88 degree weather we left the Braziel Trailhead and made our way down to our planned camping area on the ridgeline of trail 204. We made the 4.6 miles easily not too long before sundown. After dropping our packs, we walked down to East Bee Falls. There was not ANY water running over the falls but with some rain expected overnight and a deep pool just upstream from the edge of the falls, we knew we would be ok for water. After setting up camp, relaxing a bit, ate dinner (Mountain House sweet and sour pork), and it was quickly time for bed as a light rain began to fall. The low Friday night was 72 degrees. I awoke about daybreak to a light rain, but went back to sleep for a bit more rest. We ate breakfast (Mountain House Eggs and Bacon) and made a run to East Bee Falls to gather water for the hike. The tiniest of trickles was going over the edge of the falls – but there was water to filter. The day was hot and humid with periods of rain without any water on the trail until lunch so I packed 64 oz. of water to take me to Borden Creek – which was enough. We left our campsite just before 9 am. 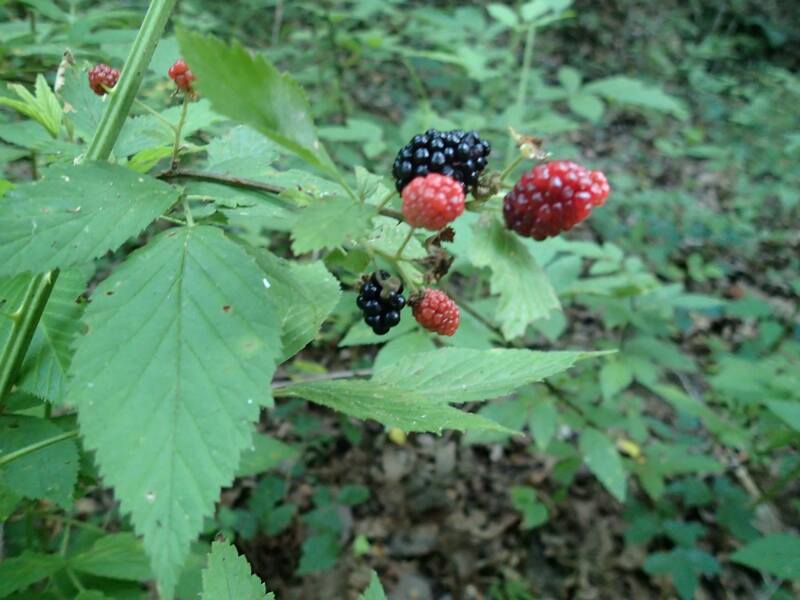 To our surprise, we found ripe blackberries along trail 224 and had an unplanned snack several times. 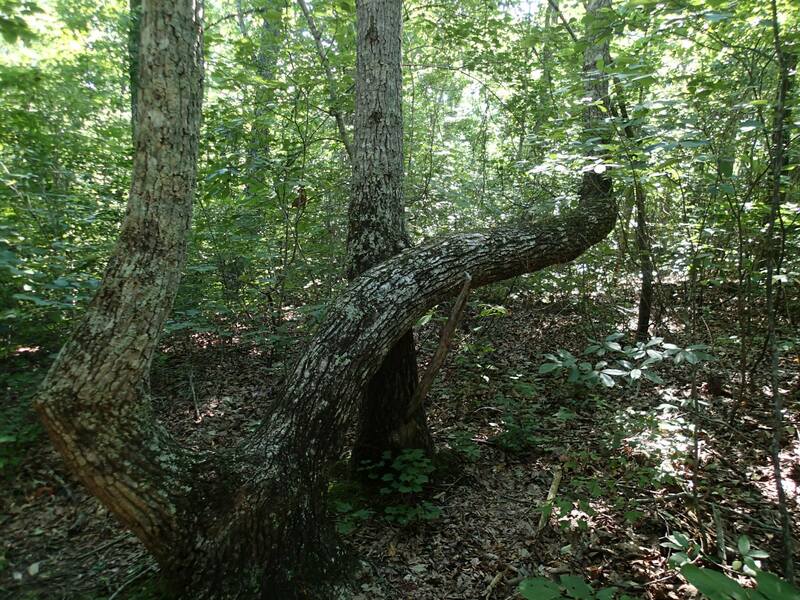 I have heard horror stories about hiking the horse trails and this is why I have saved them to hike last. I was very pleased to find them in great shape and without any recent rain, there were no muddy areas to trudge through. Trail 224 has to be the flattest and straightest trail in the wilderness. As I stated earlier, there are several places of interest that call for exploration at a later date. Although the temperature Saturday was below 80, it was extremely humid – I’m not sure what part of my shirt was sweat and which part was from the periodic rain showers. Although it was overcast with some rain, the humidity was out of control and we needed lots of fluids. We made great time on trail 224 arriving at Borden Creek at 11:13. We had to climb up to the new trailhead where my friend had stashed a cooler filled with cold beverages the night before. IT WAS WORTH THE CLIMB from the creek to the trailhead! The distance from our camp on trail 204 to the Borden Creek Trailhead was 5.07 miles. After a nice long lunch break was taken, we knew we still have several miles to cover before sundown. Traveling back downhill to Borden Creek, we took a right and turned on trail 207 at 12:50 pm. FYI – once you cross Borden Creek, trial 207 goes to the left. There’s no sign, and the trail seems to go either direction on an old road. If you go to the right, it is quickly evident this is not an official trail as it’s not cleared of blowdown and other foliage is covering the trail. At one point on the trail (somewhere around halfway), we spotted 2 wild hogs down the trail. We stopped and quietly inched forward but before I could capture a video or picture of them, they ran off downhill. That was the first time I have seen hogs while hiking in the Sipsey Wilderness. 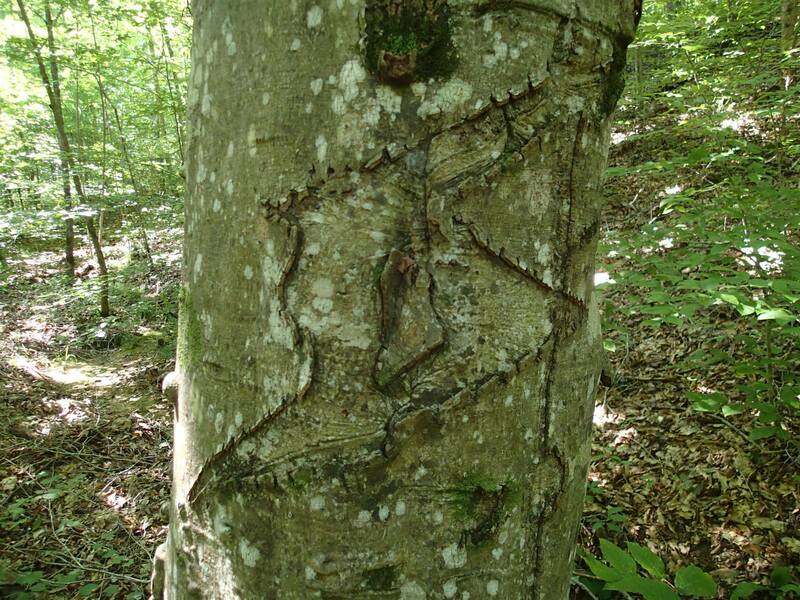 I also saw an interesting tree carving as well. There was one portion that the briars covered the trail and it appeared to be good territory for the slithering ground dwellers. That stretch was my least favorite section of the whole loop. We took it slow through this section checking for snakes before we progressed forward. While none was spotted during this section, just a mile or so before the trailhead at Gum Pond, we spotted a slithering snake in the middle of the trail and it took a few minutes to get past that area. After 5.25 miles, we arrived at the Gum Pond Trailhead at 4:00 pm where my car containing a stocked cooler waited for us. We decided to use the vehicle and make a food run to Moulton for a late lunch/early dinner. That was also a great decision. Since the “hiker funk” was in full force, we were nice and just went through the drive-thru. We sat in the parking lot and inhaled a Frisco Burger combo meal from Hardee’s. I figured we deserved since we had hiked over 10 miles earlier…. 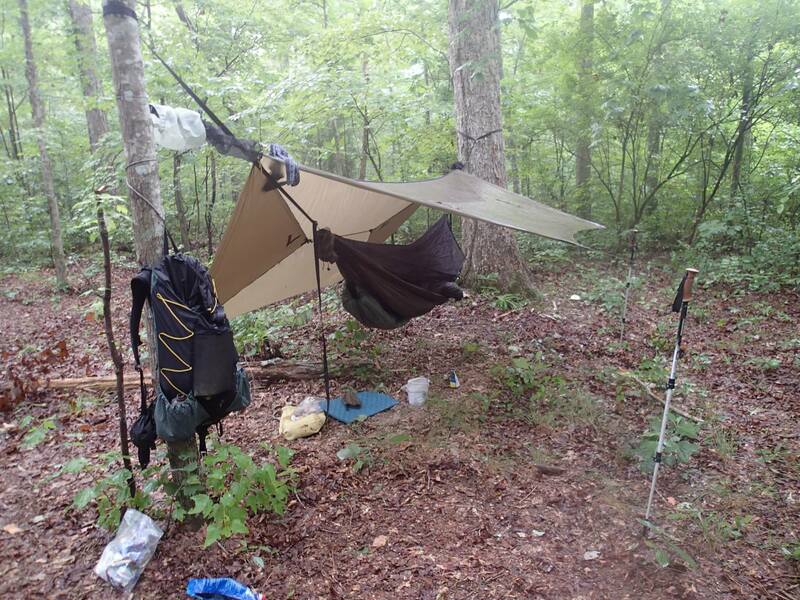 A decision was made to “car camp” and a spot was found close to Flannigan Creek. After setting up camp just before 7 pm, a much appreciated wash-down was in order and dry clothes were donned. It was heavenly. It was heavenly until the frogs on Flannigan Creek started making noise and another strange noise – it almost sounded like a turkey but it went on well after dark and never moved. I should have recorded it but didn’t. Regardless, I quickly fell asleep in the hammock. I believe the high that day was 80 and the low during the night was near 60. Sunday morning, we dropped everything but the essentials (food, water, navigation) in the car as we drove back to Gum Pond Trailhead. We headed out on trail 210 at 8:12 am. Knowing this was another trail away from water, I carried another 64 oz. of water for the hike. We kept our eyes open on the way to trail 210 passing the spot where Mr. No Shoulders had been spotted the day before but thankfully we didn’t see another one. After the bridge over Hagood Creek, we turned off trail 208. 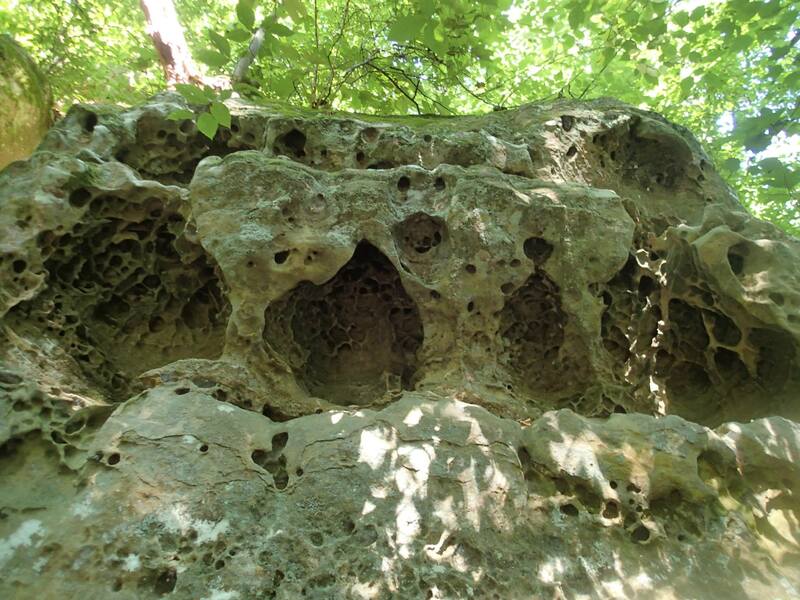 Trail 210 follows the bottom of a bluff containing some very pretty rock formations for the first portion. Eventually a switchback is discovered and uphill we go. 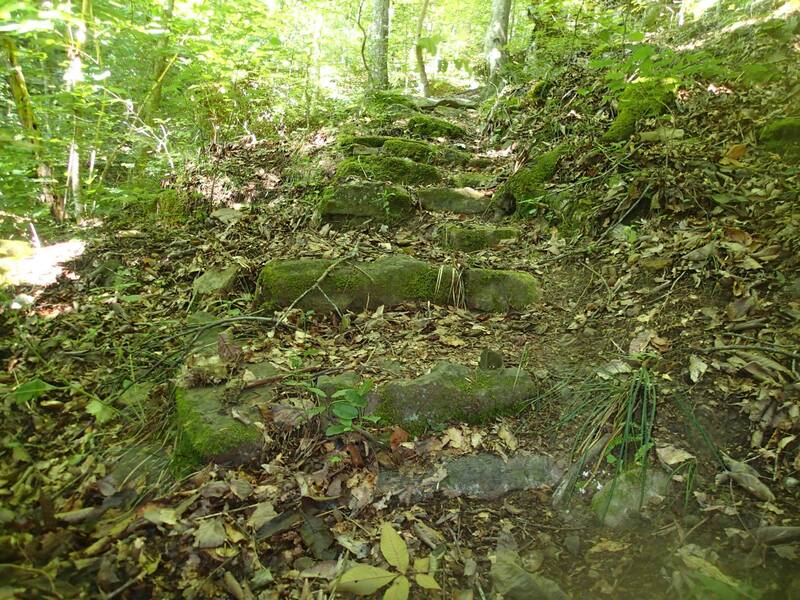 Thankfully, the trail maintainers have built some stone steps here allowing an easier climb. Thank you! The rest of the trail meanders the ridge and would be very pretty when there are no leaves on the trees. 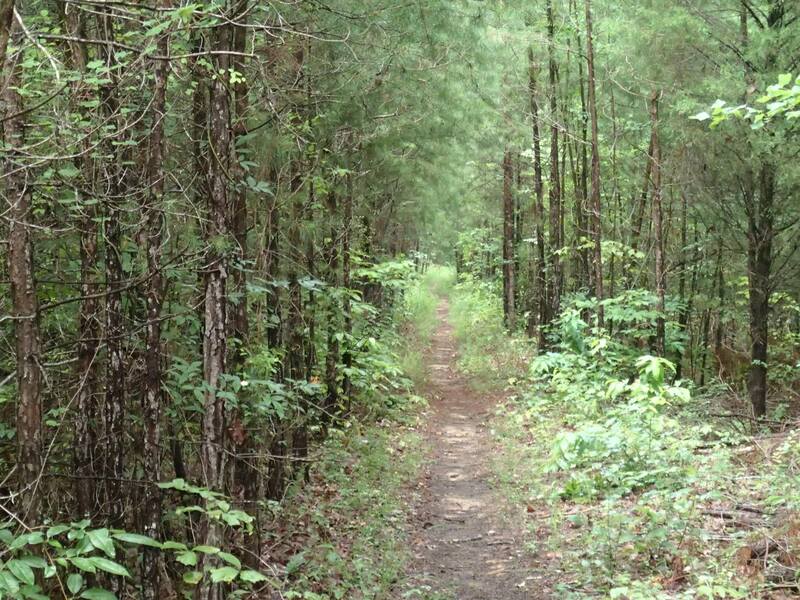 This is a nice ridgeline trail that flirts with an old road(s) many times along the way. Beside the trail there were several interesting items. 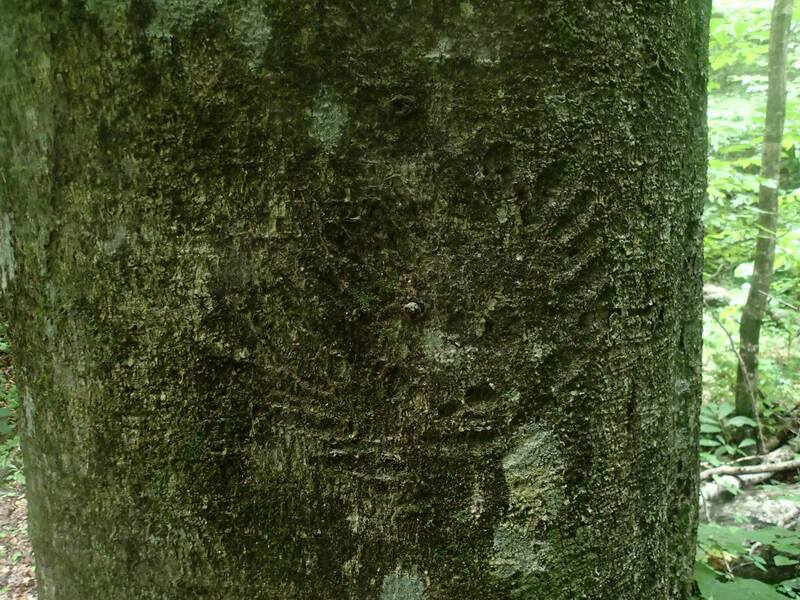 One was what appeared to be an Indian Marker tree, and another old tree carving. There are many switchbacks on this trail through the draws on the ridge. You can see either where you are going or where you had just walked from for much of the last half of this trail. Even so, the trail was enjoyable as most of the elevation gain and loss was gentle rolling hills. The high was around 80 degrees but since the sun was out the humidity was much lower. I sweated much less than on Saturday. 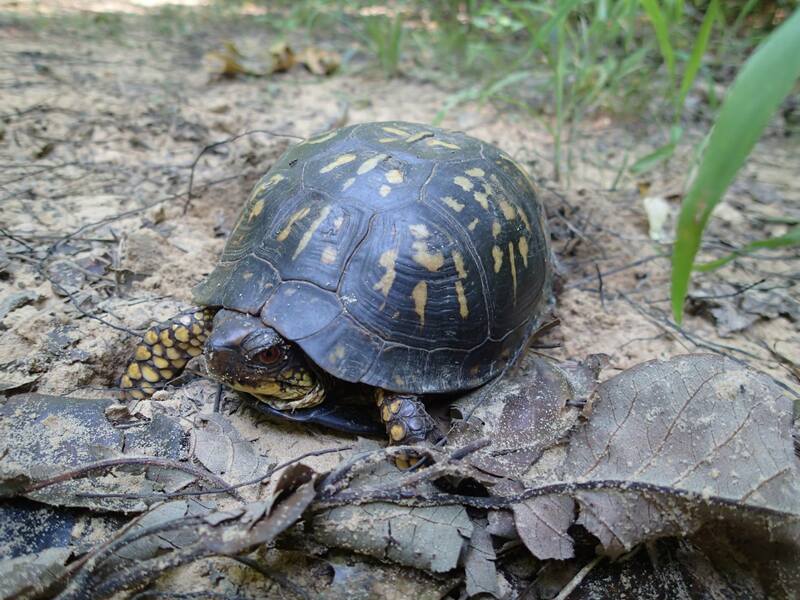 Unfortunately, about 2.5 miles from the trailhead, we spotted/almost stepped on another Mr. No Shoulders. I was now ready to be out of the woods! We were more than happy when we finally hiked the 7.58 miles to return to the Braziel Trailhead arriving at 12:37. Thank you. I really enjoy all of my gear – it’s perfect for me. Great report Jay. I was happy to hike vicariously through you on this one. I can’t hike in this kind of weather. I spend my days in a warehouse that routinely hits 115+ degrees. I dream of cold showers every day. Sounds like a heck of a trip none the less.